Home→The Monthly at Cornelia Street Cafe→040718: Eco-Fiction. Now. 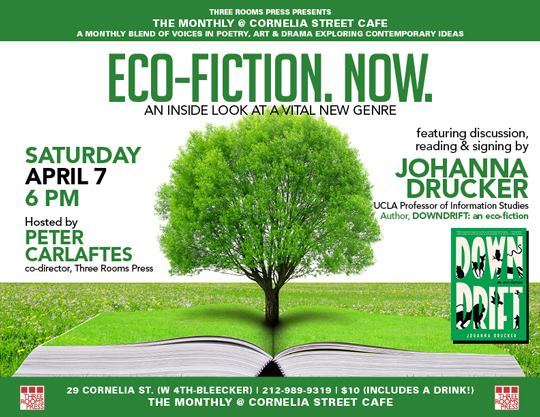 A Special Saturday Edition of The Monthly at Cornelia Street Cafe. Three Rooms Press presents ECO-FICTION. NOW: An Inside Look at a Vital New Genre, an intriguing and important discussion by internationally renowned thought leaders about the growth of the eco-fiction literary genre, which uses ecological topics and themes to develop genuinely creative work. Copies of DOWNDRIFT will be available for purchase and signing at the event. Johanna Drucker is an artist, writer, critic, historian, and theorist, internationally known for her creative and scholarly work in digital humanities, visual poetry, and artists’ books. She is a professor of information studies at UCLA and the Bernard and Martin Breslauer Professor of Bibliography. She has published more than a dozen scholarly works, including novels, nonfiction, and a definitive work on artists books.